With so many promising adventures to see at gamescom 2017, we just couldn’t cover them all in a single article. Our first round-up featured games like The Inner World 2, Tokyo Dark and Unforeseen Incidents, but there were plenty more where those came from. So once again, my German colleagues Matthias Glanznig and Peter Färberböck from Adventure Corner have joined forces with me to highlight another impressive range of games on display in Cologne. 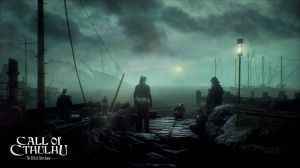 Focus Home Interactive invited us to have look at their new horror adventure game Call of Cthulhu, developed by Cyanide Studio. They pointed out a fitting description of it as well as the Lovecraft universe itself: The struggle against insanity. Narratively speaking, the game is based on the pen & paper roleplaying game of the same title. Thus, Cyanide mentioned proudly that Mark Morrison, one of the most well-known authors for the RPG, helped them out with their story. We got a look at the second chapter through the eyes of the main character. It all takes place in a small village on an island called Darkwater. In the spirit of H. P. Lovecraft, the game is set during prohibition in the 1920s, when private detective Edward Pierce arrives at the gloomy port village. Dark clouds overshadow the whole island. Mud is all over the place and the inhabitants are not that friendly towards the detective – he is an outlander after all. Lovecraftians will most likely appreciate the familiar dark setting. Recently Pierce found a mysterious painting in his mail, painted by Sarah Hawkins, whose family has an estate on the island. Here the investigation begins and Edwards wants to understand what that painting’s mystery is about. As Pierce openly explores the island, different approaches are possible. We might, for example, just try to get an inhabitant’s trust by going into the inn and treating some talkative guy to a drink. We could also try to gain trust by helping other people. It is up to the player. Coming into the presentation, we felt fairly let down that Call of Cthulhu was being referred to as an investigative RPG. Soon, however, we realized that while this horror game has skill trees and an open world, at its heart it still appears to be a more traditional first-person adventure game. There are no Quick Time Events or action sequences in it – everything revolves around investigating the island and solving different cases. Many details reminded us of the Sherlock Holmes series from Frogwares. There are a lot of dialogues and the trusty old radial menu once again controls them. It seems like every single character can be talked to, but that does not automatically imply that the conversation will help the investigation. Call of Cthulhu allows us to tailor our detective to our needs and preferred playing style, thanks to the four skill trees (Talk, Clue, Examine and Physical) in the game. These skills can alter our different opportunities. We could get new choices during various dialogues or we might be able to examine and understand inscriptions, old texts or even corpses. Not every single skill can be acquired during one playthrough. Cyanide emphasised repeatedly that the game has no combat. Even the Physical tree is used solely during dialogues or for lock picking. You might get into a brawl if you use those dialogue choices, but they are resolved automatically. Violence is never necessary, but a viable option to advance the investigation. Similar to other roleplaying games, this horror adventure has various factions. For example, the police do not fancy Edward or any private investigators, therefore we should stay low-key. Smugglers are dubious and unfriendly but we can do some work to befriend them. Edward is also able to spy on some characters to learn new dialogue options and gain additional choices. Certain deeds might also influence his reputation. However, this is a Lovecraft tale, so we also need to mind Edward’s sanity. Some tasks may damage his mental stability, causing him to slip off into the realm of Cthulhu more and more. These hallucinations represent the horror elements of the game. Madness is the centrepiece of them and the developers are trying to trigger a certain subtle kind of fear. We will not have to hide behind crates to let monsters pass, but we will have to take care of Pierce’s unstable psyche. To make things a bit more comfortable, he always carries along his trusty lighter, but as the player, we are kept in the dark about whether what we’re seeing is real or just an illusion. Cyanide wants to give us the feeling that we are inside a new story by H. P. Lovecraft. They want to create a unique tale and even suggested that fans might see an Elder One of the old aliens/deities from the Lovecraft universe. Call of Cthulhu caught us by surprise, especially since we were not quite sure what kind of game we could expect before the event. Now it is quite clear that it can be considered an adventure that completely omits action sequences. Imagine the Sherlock Holmes adventures from Frogwares in the Lovecraftian universe, then you get the picture. 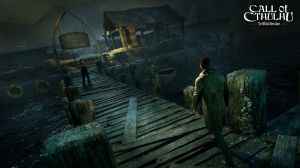 Essentially, we can expect a game with subtle horror elements and loads of investigation in a rather open world. It is an ambitious project and it already looks quite good. It is definitely one to watch. 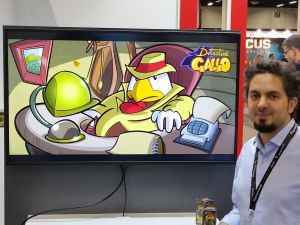 This year’s gamescom enabled me to check out the 2D point-and-click adventure Detective Gallo from Italian studio Footprints. While the game borrows familiar elements from hard-boiled detective stories, it certainly spices things up with aspects you wouldn’t quite expect from a Philip Marlowe or Sam Spade story. 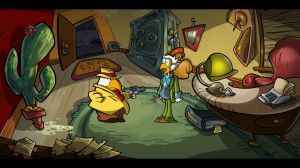 Like, for example, the game’s protagonist Detective Gallo – a feathered, ill-tempered P.I. who would prefer to just shoot people instead of solving cases. As you can probably tell, Gallo is not exactly a pleasant person – or rather, duck – so he probably chose a cactus as his sidekick and best friend because the cactus is unable to disagree with anything Gallo says. In meeting with publisher Adventure Productions, Adriano Bizzoco gave me a quick introduction to the game and let me play a demo afterwards. Right away, it was easy to tell that the hand-drawn graphics were created by people who know their craft. Being a huge fan of Disney’s original DuckTales series as a kid, I had kind of a déjà vu when I looked at some of the characters in the game. That impression was confirmed when Adriano named the show an important visual influence before he moved on to the general impact that LucasArts classics had on the game. After watching a fancy black-and-white intro, I literally got thrown into the game. Well, to be precise, the slightly sociopathic detective was kicked out of a bar. A few seconds later, I entered Gallo’s office and ran into an unknown visitor. Luckily, he was able to reveal himself as a potential client before Gallo could riddle him with bullets for trespassing. As it turns out, that visitor was a multi-billionaire named Phil Cloro, who wanted Gallo to solve a blood-curdling crime: the murder of Cloro’s favorite plants. Sounds nuts? Absolutely! Seemingly in a rather entertaining way, though! Once the new client left, I was alone in Gallo’s office. Just as in the few other locations I saw, I noticed that this small scene contained lots of hotspots. I particularly liked that there was a lot of unique feedback to my actions, containing plenty of wicked comments and hints from Gallo. To interact with the environment, a simple two-button interface (look, use) comes into play. The inventory can be accessed by moving the mouse cursor to the upper part of the screen. In terms of the puzzles, I was only able to get a brief glimpse, but as new items ended up in my collection, it seems safe to say that inventory puzzles are going to be an important part of the final game. One puzzle chain started with the discovery of a bullet at the crime scene. The bullet had an engraving that I was not able to read. Fortunately, Gallo’s microscope seemed like a good way of magnifying the inscription. Too bad the microscope was in the P.I.’s office safe, and the detective can’t remember the code. Well, at least the grumpy protagonist hints that he has hidden three reminders in the room that – in combination – will reveal the correct code. But even discovering those required a bit more than just clicking on things to find the three hints and open the safe. One reminder, for instance, was easy to find, but it had been bleached out, so I needed to find a way of making it readable again. Copyright © 2014 - 2019 SocksCap64, All Rights Reserved. Logos, Trademarks, Pictures Belongs To Their Respected Owners. Powered By WordPress. 85 Queries in 0.374 seconds.